The house is newly refurbished and is ideal for larger groups or extended families, having two sections, which are connected at ground floor level, each with four bedrooms and each with fully modernised kitchens. The larger kitchen is designed for catering/dining for big groups. It is set in an extensive garden with a separate barn. There is a table tennis table and permanent BBQ on the patio. The golf course is five minutes walk away and the Spa with its many swimming pools is ten minutes walk. There are many bars and restaurants in Moravske. The National Park is a short drive to the North. The new motorway to Maribor and Ljubliana is a five minute drive allowing easy access to the ski slopes in Winter. 4 Bathrooms, 1 Separate WC Bathroom 1 - Toilet, Bath with Shower, Bidet Bathroom 2,3,4- Toilet, Bath with Shower Bathroom 5 - Toilet All bathrooms include heated towel rails,bath with shower and toilet. Notes on accommodation: Non smoking. 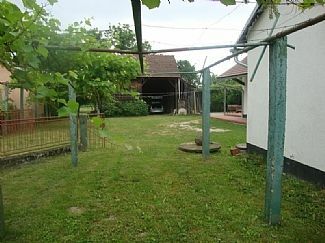 Outside: Patio with BBQ, garden furniture (large wooden table and seats), two bikes, shaded vine areas, orchard, large barn, table tennis. Utility Room: Washing machine, wc, hand basin. Cleaning / Towels / Linen / Maid service: All towels, bedlinen and laundry soap included. Property maintained and cleaned regularly. Other: Dining area has a highchair and seating for 18 people. Boiler and store room in cellar. We were a family group of 18 people betwen the ages of 11 months and 69 years living in Indonesia, the UK, Switzerland ans the Netherlands. There is not much to be done or seen within walking distance, but within a 50 km radius there is plenty to be seen or done. The beds are good, with four bathrooms things go smoothly. On arrival, the wram water did not work, but the friendly local caretaker could solve the problem quickly. On a few minor points there is room for improvement, but on the whole we had a great time. Thank you for your positive review. We shall sort out the minor issues you refer to without delay. We are pleased that you had a good time in this often overlooked part of Slovenia. Casa muito limpa e com divisões bem dimensionadas. Possibilidade de refeições no exterior e com bom espaço para convívio. Equipamentos e comodidades adequados para grupos de pessoas. Casa molto grande e accogliente. Qualità prezzo fenomenali. Casa bella, confortevole, tranquilla e ben riscaldata. 300 miles to Slovenian coast. The Airport at Graz (Austria) is about an hour and a half by car. (Ryanair from Stansted). Bratislava; Saltzburg; Llubliana; Vienna and Budapest also accessible. There is a railway station at Murska Sobota (Llubliana - Budapest line). c. Eleven hours by car to drive from Amsterdam. Murska Sobote 4 miles. Large market town. Wine Growing region 6 miles. There is a supermarket at Moravske and a much larger one on the edge of Murska (5 miles). Local markets. Wine growing and tasting region. Wonderful countryside. Excellent walking. Sports and water sports area. Skiing in winter. Great local produce and good quality restaurants numerous spas and health centres. Interesting old Habsburg towns to explore - art, museums and architectural interest. Lovely climate and brilliant, friendly people. Booking Notes: Contact David Frost at below details. Deposit 25% weekly rental to secure reservation (non returnable). Balance 15 days before arrival. Minimum 7 nights. Payment may be in euros or pounds. Changeover Day: Fairly flexible. Notes on prices: Prices are for the property per week in euros. Reductions for small parties may be arranged.